The ACC is a treacherous beast at times. For instance, a young Notre Dame squad just had a Saturday-Monday turn around. While both games were at home, they were against arguably the two best teams in the nation, Duke and Virginia. The Irish lost both games by more than 20 points. 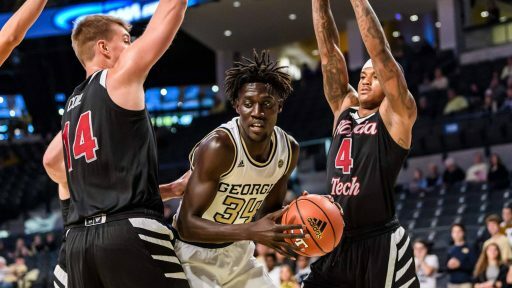 The Yellow Jackets aren't in the middle of a quick turn around such as that, but they are set to wrap up a tough 8 game stretch on Saturday with a trip to Tallahassee. Since January 9th, the Jackets have played four games against top 15 Kenpom teams, while 3 of the other 4 are top 45 teams. Notre Dame was the outlier at #94. Saturday's opponent, Florida State, has the reputation as an underachiever halfway through the ACC slate while ranking #26 by Pomeroy's metrics. The Seminoles have seemingly righted the ship lately with wins at home against Clemson and on the road in Coral Gables after a three game losing streak. They sit at 15-5 (3-4) and just ahead of the Jackets in the ACC standings. Florida State is led by longtime ACC head coach Leonard Hamilton who is in his 17th season as the Seminoles' head man. He also led Miami for 10 seasons in the 90's when the 'Canes were part of the Big East. His record at FSU is 342-213 (138-137), but in the past four seasons is 84-40 (32-27) with three postseason births, including an elite eight run last season with almost the exact same roster as this year. Since 2008-09 he has only finished outside the top 6 in the league four times. While he may be the epitome of mediocrity in the ACC, there is something to be said for being consistently competitive in the toughest basketball league in the country. Unlike most teams in the league, FSU is a "sum of its parts" team instead of being led by one particular star. If I were to choose a player most important to their success, it would be their sixth man Fi Kabengele. The nephew of NBA Hall of Fame Center Dikembe Mutombo has been the lighthouse for FSU during league play, averaging 15.3 points and and 6.4 rebounds off the bench in just 21.3 minutes per game. While Phil Cofer has dealt with a lingering foot injury, Kabengele has seemingly taken over as the leader of this team on the court. Terance Mann (17 ppg in 3 games against GT) and Trent Forrest make up Hamilton's starting back court and while both are talented, neither is a true point guard. On the season FSU is 244th in the nation in turnover percentage at 19.8%. They have tightened it up in league play a bit, bringing that number down to 17.6%, but that is still just middle of the pack in the ACC. Their turnover problems were somewhat acceptable during the out of conference because they were turning their opponents over at nearly 23%, but in league play that number has also fallen to mirror their own number at 17.6%. Florida State's biggest assets are their length and athleticism combined with their depth. As mentioned before, their leading scorer comes off the bench. That is mostly due to Kabengele's inability to stay out of foul trouble (5.9 fouls per 40) as well as having a 7'4" behemoth at starting center, JM Christ Koumadje. JMCK, now a senior, only plays 16 minutes per game but has an incredible impact in the paint while on the court. His per 40 stats are 15-12-4 blocks. Depth on the wing is not a concern for Hamilton, who has a plethora of capable players, some excelling offensively and others locking down on defense. Former McDonald's All American MJ Walker is still trying to figure it out in his sophomore season that was impacted early on by a leg injury, but the 6'5" scorer is coming off of his best game of the season, scoring 22 points (6-7 from deep) against Miami on the road. PJ Savoy is also still in Tallahassee and still hunting his shot like Adam Greentree hunts Elk. Defensively, David Nichols, a transfer from Albany, is relentless on the ball and gives maximum effort. 6'5" Devin Vassell also gives quality defensive minutes off the bench as one of the best freshman defenders in a league this year. Cofer, who led the team in scoring last season, missed most of the out of conference slate with a foot injury. Since his return in late December he has not been as effective, averaging just 8.4 points and 3 rebounds and notching double figures only twice in 8 games. He sat a couple of recent games due to the injury before returning for the Miami game where he scored 4 points in 19 minutes. Perhaps the most concerning statistic for this game is Florida State's ability to rebound the ball on the offensive glass. The Seminoles are 20th in the nation at 35.6% in offensive rebounding, while Georgia Tech ranks 283rd in the nation and 13th in the ACC in giving up second chances. The interesting thing here is that Georgia Tech just held the fourth best team in the league in offensive rebounding (UNC) to just 5 OR's for the game on Tuesday. Yet another feast or famine statistic when it comes to the Yellow Jackets. During the Josh Pastner era the Jackets have split the series with FSU 1-1, with each home team collecting a win. Dating back to the 2010-11 season however, Georgia Tech is 2-6 against the 'Noles with a 1-3 record in Tallahassee. That singular win came in February 2016. The Seminoles are also an impressive 51-7 in home games dating back to the 2015-16 season. All in all, it doesn't look great for the good guys in this one, but after the first 25 minutes of the Duke game, who knows? FSU has not looked great since Cam Reddish hit that triple in Tallahassee, and their wins over Miami and Clemson don't look as good as the losses to Pitt and Boston College look bad. Kenpom has the game at 71-61 FSU, while Haslam has it at 71-58 FSU. I think it is too many points in both instances. I like the Jackets to cover, but Tallahassee is a tough place to play. I think this will be a squeaker. About ready to purge my memory of Pastner ball too. Interesting yesterday in chat, @Gtbowhunter90 asked why we ever fired Hewitt. I think CBG could coach circles around Hewitt and Pastner could coach circles around both of them. Is that an endorsement? Absolutely not. But y’all need to live with the fact that the man is our coach for the next 2.5 years most likely regardless of results. Speaking with a member of this board yesterday, I think there is an obvious deficiency on our bench. Our original staff was A+ but right now I’d give it a soft C. I don’t like calling out kids but damn Pastner needs to come to grips with who can and cannot play. lauraee, Gtbowhunter90, Bogey404 and 5 others like this. Keep shooting Curt. A bad attempt from CGB is better than a good attempt from anyone else on this team save Devoe. GTJason, forensicbuzz, Chattjacket and 4 others like this. I see this pretty frequently, and Okogie is playing great in the NBA, but while I think we’d be better with Okogie, I don’t see a great year. Early in the year, we were playing a three-point centric offense, and I don’t see us being much better with Okogie. We’d have needed a different offense for him to shine, and I don’t think our coaches had that in their heads. Maybe we’re two or three games better right now with him. I see one game for sure, but others are doubtful. Who would he replace? Haywood? Alston? AD? Banks? Devoe? Yeah, he’d replace any of them, but then we lose what they brought too. And what would we be building for next year? We’d be better, but there would still be issues. I agree with some of what I’ve seen here. I haven’t seen a well coached offense this season. I think we were better coached two years ago. Um what? First off people aren't pointing to Okogie because of what he is doing in the NBA. He was a great defender here last year and scored 18 a game. Second, he would solve one of our biggest issues in not having a go to guy, and his 38% from 3 would also help. But yeah, we'd lose what Alston gives us.... lol. I don't think you realize how good he was for us last year. gte447f, GaTech4ever, ESPNjacket and 2 others like this. Wow even worse than the 29 against UVa we had a few years back. At least UVa was/is known for its defense. "The ACC said it surpassed the previous low mark for a league team set by Georgia Tech in a 57-28 loss to Virginia in January 2015." Peacone36, awbuzz and lauraee like this. Haywood is clearly the biggest disappointment of this season. On 3s, he’s 1 for his last 22, with MANY of them GREAT looks. I’ve said before, he could benefit from a sports psychologist, his mental game crashes with misses. Just don’t know if he’s ever going to improve much, may have hit ceiling and he’s supposed to be this team’s marksman. gte447f, THWG and jbix80 like this. Just sliding Jose and Devoe down from "the man" to "just help out" would be huge. Yesterday we had no one with any type of confidence in their offensive ability. You put Okogie as a lead dog out there with his 18 points and I would be more than happy to bury Haywood on the bench and have defenses geared to stopping Okogie with lots of really open shots for Jose and Devoe. My bet is they make more than the 2 for 200 nonsense they have done recently. gte447f and ESPNjacket like this. It was long past time to fire Hewitt when we finally did so. Interesting you talk about assistants in the second paragraph when Hewitt was the poster boy for letting his staff degrade. I will come to CJP's defense on his rotations - sort of. He has 4 guys he would never take out of a game if he didn't have foul trouble or he finally has to recognize they are not cyborgs. These guys have really long leashes. The 5th spot starts with Haywood but has a hair trigger. No one has locked that spot down and no one has given him any real options. So in the face of no options he has ultimate options until he finds someone. Throw in foul trouble like we had yesterday and unlimited options extend beyond just the 5th spot. And since there is no hierarchy, chaos until someone is hot like Cole was yesterday who then got a major run. That's the sort of part. The rest is it is his job to establish a hierarchy so there are roles. Guys play better when they know their roles and have some understanding of what is going to happen instead of a fear of the hair trigger leash running things. I have no inside knowledge so this is speculation, but I expect that is a big part of what is going on with Haywood. There is a real significant issue with confidence across this team and I think it comes back to this. Pastner has started more projects on this roster than I have in the house I am trying to fix up to sell. None of them have panned out yet but he still needs to commit to whatever he wants to commit to and ride it. Some kids will be pissed but overall I think we will see improved confidence across those that do play. gte447f and jbix80 like this. Interesting yesterday in chat, Speaking with a member of this board yesterday, I think there is an obvious deficiency on our bench. Our original staff was A+ but right now I’d give it a soft C. I don’t like calling out kids but damn Pastner needs to come to grips with who can and cannot play. The team's record is about what I expected this year, losing Lammers and Okogie and having very little upperclassman talent. The odd rotations are a cause for concern. William S. Baker and Peacone36 like this. 29 is the threshold in my head whenever we play. Guess that was so that we'd be above 28... That was a rough game to watch. Purging the memory of Gregory ball is a good idea. awbuzz and THWG like this. Well thank God that stretch is over. We get two whole games before our next set of back to back top 25 match ups. This league is killer man. THWG and lauraee like this.